What Are Target Date Funds? How do They Work? Target date funds (TDFs) were first introduced in the early 1990s by Barclays Global Investors (BGI) and were originally used for college savings plans. The target date, for example the 2020 fund, is an event date. In the case of college savings plans, it’s the year that a student intends to enroll in a college. 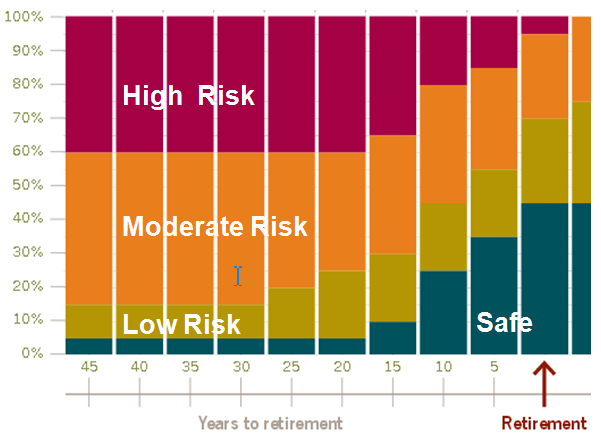 Target date funds’ asset allocation mix provides exposure to return-seeking assets, such as equities, in early years when risk capacity is higher, and becomes increasingly conservative as time progresses with exposure switched progressively toward capital-preservation assets, such as short-term bonds. This asset movement through time from more to less risk is called a “glide path.” Eventually, target date funds began to be used for retirement savings plans, especially 401(k) plans. The event date in this application is the year in which an investor intends to retire. Usage of TDFs remained minimal until 2006, when two major events brought TDFs to the forefront. First, behavioral scientists recommended that 401(k) plans use automatic enrollment to encourage participation. Employees would need to choose to be excluded from the plan, whereas they formerly needed to sign on for the plan. Behavioral scientists were right. 401(k) participation skyrocketed, but this created a new challenge. 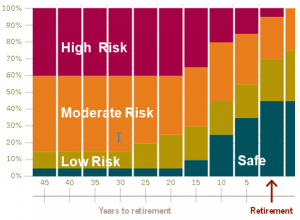 Many 401(k) participants were either unable or incapable of making an investment decision so they defaulted to their employers who, typically, placed their contributions in very safe assets, like cash. This led to the second major event: passage of the Pension Protection Act of 2006 (PPA). The PPA specifies three Qualified Default Investment Alternatives (QDIAs) that plan sponsors can use for participants who do not make an investment election: Target Date Funds, Balanced Funds, and Managed Accounts (accounts managed by outside professionals). By far the most popular QDIA has been TDFs. Subsequent to the PPA, target date fund assets grew from $0 to about $150 billion in just two short years. This set the stage for serious disappointment in 2008 when the typical 2010 fund lost 25%. As a consequence of this pathetic loss, the U.S. Securities and Exchange Commission (SEC) and the Department of Labor (DOL) held joint hearings in 2009, and subsequently threatened to regulate TDFs in a variety of ways, specifically by requiring more disclosures. At the time of this writing, these threats remain to be carried out. In the meantime, risk near the target date has actually increased as funds position for the performance horse race. Assets currently stand at $800 billion.